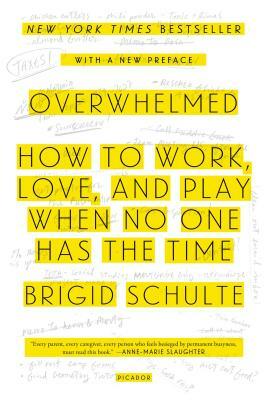 When award-winning journalist Brigid Schulte, a harried mother of two, realized she was living a life of all work and no play, she decided to find out why she felt so overwhelmed. This book is the story of what she discovered—and of how her search for answers became a journey toward a life of less stress and more leisure. Schulte's findings are illuminating, puzzling, and, at times, maddening: Being overwhelmed is even affecting the size of our brains. But she also encounters signs of real progress—evidence that what the ancient Greeks called "the good life" is attainable after all. Schulte talks to companies who are inventing a new kind of workplace; travels to countries where policies support office cultures that don't equate shorter hours with laziness (and where people actually get more done); meets couples who have figured out how to share responsibilities. Enlivened by personal anecdotes, humor, and hope, Overwhelmed is a book about modern life—a revelation of the misguided beliefs and real stresses that have made leisure feel like a thing of the past, and of how we can find time for it in the present. Brigid Schulte is an award-winning journalist for The Washington Post and The Washington Post Magazine, and was part of a team that won the Pulitzer Prize. She is also a fellow at the New America Foundation. She lives in Alexandria, Virginia, with her husband and their two children. “Everyparent, every caregiver, every person who feels besieged by permanent busyness, must read this book. A new wave of research, experience, and insight is challenging deep assumptions about why we have to live and work the way we do. Overwhelmed is a wake-up call and an exhilarating prescription for change.” —Anne-Marie Slaughter, president and CEO of the New America Foundation and author of "Why Women Still Can't Have It All"